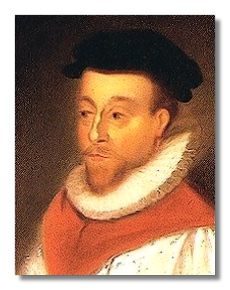 Here we want to introduce you to the polyphonic choral music of Orlando Gibbons (1563-1625). From the age of 23 until his death, he held one of the prime positions in English music, the organist of the Chapel Royal. Polyphony means the simultaneous sounding of various melodies. We will take apart his anthem, Hosanna to the son of David, so you can hear each independent section and get a feeling for the way the six individual voices interact. As we go along, listen to each section as many times as you like so you really get a feel for the interweaving of the sound. Part I—Hosanna to the son of David. Those are the words to listen for in this section of the music. Listen! Part II—Blessed is He that cometh in the name of the Lord. Part III—Blessed be the King of Israel that cometh in the name of the Lord. Part V—Hosanna to the highest heavens. Now that we’ve gone through the entire work, listen to the complete piece from beginning to end. Not all polyphonic pieces can be taken apart so neatly. Many times the voices act in a much freer way so they do not fall into sections as these do. This anthem is more the exception than the rule.